Reviewed by Henry Reed, Ph.D. Remote viewing—the term brings up the image of a spy telescope. It’s a dramatic example of the loss of a boundary. For some it means added power. For others, it spells added vulnerability. Can you really spy on the secret life of others with remote viewing? Maybe so, maybe not. When remote viewing came to the attention of the media some years back, it was a big deal: The government has been secretly using psychic spies! On the TV show, “Put it to the test,” one of the more prominent remote viewers, Joe McMoneagle, was demonstrating the process. He was performing a remote view of something he knew not what. Thanks to a remote camera, the TV audience was able to see the target, a harbor. As Joe drew a diagram and described the elements he saw, the TV audience could see that his sketching was matching the visual elements of the scene. Then something happened, something that was unscripted yet very dramatic. What the TV audience saw was that a large ship was moving through the scene, temporarily blocking the view of the harbor. As it did so, Joe began to pause and noted that somehow he couldn’t see the scene any more, it was being blocked! It was a real time, dramatic demonstration of the real time accuracy of remote viewing. On the other hand, unlike the TV audience, Joe didn’t seem any the the wiser about what he was looking at. Remote viewing became a big deal. The secret was out. The various folks working for the military as remote viewers began to emerge from the woodwork, each with a book to sell. Some of my students helped me summarize all of them, and more, in a collection entitled, The All Seeing Eye: A Remote Viewing Omni Reader. Remote viewing has been perhaps the most successful commercialization of psychic training in history, as many of the author’s formed private companies to share their experience with those who could pay large fees. Furthermore, unlike most ESP training seminars, remote viewing attracted a largely male audience! There was something about the connotations of the label, remote viewing, that appeals to the masculine mentality more than to the feminine. Judging from the reports of the methodology, remote viewing presents us with an odd question: How is it possible to accurately perceive an ordinary scene with remote viewing, but not know what you are looking at, whereas anyone looking at the scene with their physical eyes could immediately recognize and understand the view? In one application of remote viewing, the attempt is made to locate someone who has been abducted and is hidden away somewhere. Remote viewers can describe the appearance of the physical surroundings of the missing person, yet not provide the information needed (address or geographic coordinates) to locate and retrieve the person. Remote viewing does seem to exhibit the same bias as other ESP skills, namely it is better at visual information than cognitive information. One of my favorite remote viewing experiments involved Ingo Swann, the psychic credited as the inventor of remote viewing. Unbeknownst to Ingo, the researchers had created an optical illusion inside of a box. Would Ingo “see” the box and its arrangement, or would he see the illusion? Or, maybe both? If memory serves, it was the illusion he saw. In either case, the experiment points to an important question, “is remote viewing capable of more than noting physical attributes of a distant scene? Can it bring wisdom, or at least improved understanding? That’s a question I put to the author of a new and very different book on remote viewing. 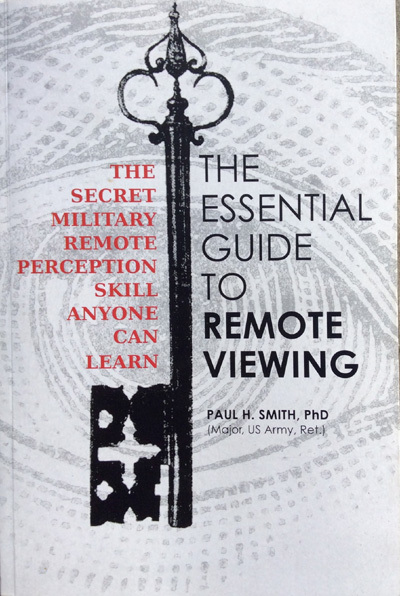 The Essential Guide to Remote Viewing is the work of a soldier gone academic, Paul H. Smith, Ph.D. It stands out from all the other books on the subject. First, it is a very open discussion of the subject. Dr. Smith is even willing to label it as an example of ESP—so many of the early writings on the subject denied that remote viewing had any connection whatsoever with psychic ability. The commercial value of remote viewing is absent except for one very important application—making money! Yes, it is true. In a chapter responding to the question, “If ESP is real, why can’t we make money by it?” Dr. Smith explains exactly how to do so, and tells the story of a person who made a bundle. I’ve read of similar stories, and the method makes sense to me. I’ll not spill the beans here, as I’d rather you read the book. Another thing that makes Dr. Smith’s book unique: He describes the various forms of remote viewing, and does so without prejudice, even though many of the “forms” are also proprietary methods that serve more commercial than scientific purposes. He gives a good chapter on how to learn to do the original form of remote viewing. He presents the evidence for the reality of remote viewing, and gives us good training on how to be skeptical without become a denier. Compared to the other books on the subject, Dr. Smith’s is a refreshing read. He is a good story teller (not to mention a fantastic artist!) and has earned his academic credentials. He has perhaps the most information-loaded website of any remote viewer practitioner, including previously secret documents from the infamous "Stargate Project." I am admitted fan of Dr. Smith and his work. While other retired military were out making a bundle teaching their brand of remote viewing, Paul H. Smith was working hard to develop an academic standing on the subject. He has also been quite active in creating a scientific society, The International Remote Viewing Association. Paul is also an incredible artist—I recommend that you enjoy a few minutes looking at his artwork online. For another, after succeeding in his remote viewing work, Paul went on to get a Ph.D. in the philosophy of science. His dissertation is about the process by which the doctrine of “physicality” has to be replaced by a paradigm based in consciousness. It’s an incredible effort, and for those with a deeper interest in metaphysics, I would encourage you to download a copy of his doctoral presentation. In my estimation, Paul’s Essential Guide is required reading for anyone with more than a passing interest in the subjects. It creates a respectable and open-hearted atmosphere for exploring what might become something that will really make a difference for us. It is easy to trust what you read in his book, as he is less interested in selling a unique method than getting us all to embrace and explore a reality that opens more questions than answers. Reading his book has helped me settle some long-standing questions. If we can think of remote viewing as a specific method of harvesting unconscious information that has already present, via a psychic connection, then remote viewing is not really a skill of psychic reception, but rather a cognitive skill of retrieving such information. Remote viewing becomes then a reliable process of demonstrating the psychic connection, not creating it. I could see how the early remote viewing authors might deny that they are dealing with a psychic phenomenon, and thus preserve their credibility. That its name, remote viewing, would have connotations of conscious penetration beyond boundaries, would appeal to the masculine principle, makes a lot of sense. That remote viewing implies the non-locality of consciousness, and thus our interconnectedness—a feminine principle—may, or may not be a sufficient aspect for remote viewing to lead us to better relationships. Time will tell. Interview with Paul Smith, Ph.D.
1) There have been several books published on remote viewing by folks who were in the military who tell the story of the use of RV for such purposes. Your book also covers that topic, but from your point of view, from your time in service. What makes it worth folks’ time to read your version of that history? Paul: I’m presuming this question relates to my first book, “Reading the Enemy’s Mind” (RTEM), since that book had more to do with RV history than my current one. So I’ll answer it from that perspective. Nearly all the other books published about Star Gate were written by the participants as memoirs or personal accounts. As such, the authors relied largely on their memories to recount their tale, with very little attention to objective research or to other participants’ perspectives or input. Consequently, their content is subject to the typical lapses, errors, and distortions one would expect from a memoir based on the foibles of human recollection. Technically, my book is also a memoir, but I went into it alert to the weaknesses of my own memory. For that reason, I relied much more heavily on interviews from and questions to other participants (approximately fifty people, including multiple interviews with several of them); on a contemporaneous journal I kept during significant periods of the story; and on a fairly copious collection of documents, many of them declassified not long before the completion deadline for the book. Though I can’t rule out the occasional memory lapse, for those reasons the book is probably the most accurate portrayal of the military’s remote viewing effort available. But RTEM is probably also the most comprehensive treatment (though it runs competition with Schnabel’s book). I didn’t confine my research and writing to just the seven years during which I was assigned. Using interviews and documentation from the entire 23 years the program existed, I cover material from the beginning to the end that no one else does. Of course, much of this holds true for my second book as well, which was not meant as a memoir. 2) What do you make of the significance of the military’s use of RV? Should we care? Does it make a difference? This could be answered on more than one level. The first is the actual military/intel application—did the results justify the effort? The answer to this is “partially.” Some of the operational results did in fact make a difference to a tactical or strategic situation. The long-term value of these successes is harder to evaluate, as is often the case involving other, more conventional means of intelligence collection. For example, the vast majority of the reconnaissance satellite take is of little relevance, and even that which proves to have intelligence value may affect things only for a little while. Only occasionally does it have lasting, world-changing consequences, and sometimes that isn’t known for years. The same could be said for what remote viewing accomplished in the military, albeit on a much smaller scale. Where the military involvement does make a difference is in the grander scheme of things. That remote viewing (along with related phenomena) is real has profound (and paradigm changing) implications for our understanding of human nature. In researching consciousness, especially ESP, there have been discoveries, breakthroughs, and evidence produced over many decades. This has often and easily (and unreasonably) been dismissed by the mainstream as the product of a few gullible researchers, frauds, or eccentrics. But when it turned out that both the CIA and the military intelligence agencies had engaged in researching and applying non-local consciousness for almost a quarter of a century—and that there were concrete, observable fruits of that effort—it became much harder for the mainstream to shoo the phenomenon away with a mere wave of its figurative hand. This was especially true since by 1995 the military had become one of the most respected institutions in the US—far above Congress, the clergy, and even educators. Surely if the military pursued it for so long, so the reasoning went, there must be something to it. To be sure, this hasn’t silenced the skeptics. But it has placed a rather large obstacle in their path to rejecting anything that doesn’t fit into their world view. 3) It seems that the study of RV has a strong commercial aspect. Science, ideally, works in a transparent manner, whereas it seems that there is a strong commercial proprietary aspect of the RV scene. What’s your take on that? The key here is the use of “ideally.” Much of science today is performed in a proprietary environment. Wholly-owned corporate labs conduct a large proportion of the science now being done, which of necessity places it in a for-profit environment. Universities have increasingly focused on the value of the intellectual property created by its professors and graduate students and gain revenue from licensing out patents on discoveries made in university laboratories. One of the rare science environments where business applications are not in the forefront are the government labs; still, much of that research—even non-defense related—is done in an envelope of secrecy. And even here successful research is often spun off into the corporate sphere for further development (consider both the Internet and GPS systems). Admittedly, remote viewing does have a somewhat different spin to it. This is so for several reasons. First, early adopters (including even some of the original military personnel) felt the need to modify or adapt the original methodologies to suite their own particular tastes or personalities. The result is a plethora of xRV methodologies, each keyed to an individual or particular RV school reminiscent of the early days of psychoanalysis—or of an emerging (and typically fragmented) religious movement. Further, remote viewing has been orphaned by the very womb that gave it birth, the government. Where in science there is funding, then research, then application and profit generation, which then reseeds the funding part of the cycle, remote viewing (and remote viewers) must be self-funding—and there is no longer a government budget to provide the initial development funding for the cycle. This means that anyone who has ambitions that require engaging in RV any more than a few hours a week or month have to do it in such a way that it pays at least some of the bills and puts food on the table. This automatically throws it into a business model which, to be successful, has to offer something different (hence proprietary) than anything else competitors offer. This reinforces the urge both to elaborate on original formulas, and also to make things more proprietary. 4) The term, “remote viewing” suggests that we see things as if looking through a telescope. Seeing at a distance seems magical enough. RV even seems to leave out the subjective factor in perception, as if RV is like a camera. Is there a subjective factor? Is that why folks like Stephan Schwartz used a group approach, to factor out the subjectivity? Any perception is inherently subjective and, since it is a perceptual process, remote viewing is no exception. This subjectivity is one of the roots of what remote viewers call “mental noise,” much of which is composed of judgments made by the analytic part of the mind on incomplete perceptual information. Remote viewing results become relatively objective in those cases where for whatever reason a viewer establishes a wider bandwidth connection allowing a richer flow of information during the session—but such “clean” sessions are not the most common. Group remote viewing can help ameliorate (though not solve) the noise problem by bringing many noisy results together from which error correction techniques may extract the accurate data. This “consensus” process is common in many “noisy” fields of research. 5) Toward the end of the book you generalize from remote viewing to remote sensing of all sorts. Is remote viewing another name for clairvoyance, or is it in reference to a specific methodology of harvesting non-local information from an observer? If you simply relax and “see” at a distance, is that remote viewing? Or do you need three people, one who knows why a target is being tasked, one ignorant (of the purpose and target) person to conduct the session, and one ignorant person to do the viewing? If so, then it doesn’t seem that learning to do RV is actually of any help to the viewer, that they can’t use it for their own needs, because they have to be uninformed in order to do real RV, and can only do idiosyncratic (of their own personal style) clairvoyance. Is remote viewing another name for clairvoyance? There is obviously a family resemblance. But there are distinct differences as well. Clairvoyance, French for “clear seeing” is considered a strictly visual experience. Despite its name, remote viewing includes input from all the sensory modalities—sight, hearing, smell, taste, touch. (This is why I wish Ingo Swann had named it “remote perception” instead.) Further, clairvoyance is often used as an entrée into the Metaphysical (e.g., alternate spiritual realms, angelic domains, and so on). Remote viewing’s creators conceived of RV as a very concrete way of exploring more earthly locations, events, etc., and they eschewed metaphysical explorations. Is it a methodology for harvesting non-local information from an observer? If I understand this question correctly, the answer is no. Obtaining information from an observer implies telepathy. But remote viewing does not require an observer (other than the person doing the viewing). Rather, it seems to work very well without one. But there is a work-around. If a viewer knows another viewer, they can exchange blind viewing tasks, and those taskings could involve personal questions posed blindly to the partner-viewer. Of course, that means they have to be comfortable with each other remote viewing the opposite viewer’s secrets! 6) Is there any published evidence in a peer reviewed journal showing that training improves RV performance? No, there is no peer-reviewed published evidence either way. To go beyond that full but short answer, I will say there are lots of domains with no published evidence that training improves the skill! Indeed, a skill where such evidence were demanded would be quite rare (actually, I can’t think of any off the top of my head). We pretty much universally assume that training of any skill improves performance, usually because we can see that (most) people are better at it after training has occurred than before. The same holds true with RV. The real question (and challenge, issued from certain quarters), is whether training improves RV performance more than merely learning it seat-of-the-pants. But this is a fairly bizarre demand. In what other skill domain would such a challenge even occur to someone to make? What motivates this challenge, and upon whom is the burden of proof? Certain people assert that training makes no difference based on evidence they themselves claim exists but have failed to produce. Until there is a real reason (instead of unreasonable demands) to engage in what would amount to a quite laborious research program, I don’t expect such evidence to be pursued. 7) Why do some RV “experts” often deny that remote viewing is psychic? What’s the difference? Or is it mainly a political move, trying not to alienate folks and gain acceptance from the general public? This denial started with Ingo Swann. I had several discussions with him, trying to get to the bottom of his rejection of the term psychic, and the best I can say is that he felt the word came with too much baggage and too many inaccurate a priori assumptions in the public mind (he would probably deny that I have understood his objection, but reading between the lines I think this is what it boils down to). He wanted to refer to it all as “just perception.” When I pointed out that lumping it all under that term didn’t make a distinction between remote viewing and other ESP and non-ESP related perceptual experience, I still hit push-back. I think most “experts” reject the term psychic for the general reasons I just mentioned. They’re just more inclined to admit it than Ingo was. I think if pressed hard enough any of those who could justifiably be considered "experts" would eventually admit that "Yes, remote viewing IS a form of what is popularly called 'being psychic." But for the purposes of differentiation they avoid using the term with regard to RV. Frankly, remote viewing IS a form of being psychic. It's just not the same as what comes into most people's minds when the word "psychic" is mentioned. But then, neither is Ganzfeld or presentiment or other form of demonstrable ESP-based effect. Yet in their own ways those things fit (uncomfortably) under the "psychic" umbrella as well. 8) What would be the most socially constructive use of RV to improve life among us? What is the most constructive thing that might come of remote viewing? My response: Remote viewing promises to lead us to a more enlightened and universal view of what we really are as humans—that we really do transcend our bare physical natures. Or, as Bob Monroe often said, it may lead us to realize that “we are more than our physical bodies.” That understanding, widely enough recognized, might well change the very foundations of how we treat each other and ourselves. 8a) You seem to think that advances in science and philosophy will do the trick. Charles Tart came out with a book several years ago, The End of Materialism, which makes pretty much the same point as your doctoral dissertation. There have been other demonstrations of anomalous cognition, the Ganzfeld work and the dream telepathy at Maimonides... both of these have received positive reviews. So there's plenty of evidence, as well as the needed new philosophical expositions. Yet what has happened? Not a whole lot in terms of the world's attitudes, and relationships, a change which I agree could come from non-local reality. But what will really bring about this change? More science? More philosophy? More first-person accounts of the practical use of non-local awareness? Wouldn't it help a lot if there were some use of RV that folks could apply and change their attitudes and behaviors?